Newer PostEPO – Is It Worth The Risk? When it comes to rising talents that had big potentials of becoming bodybuilding legends but who retired too early, IFBB Pro Chris Cook is a name that comes to mind. In addition this article is a story about his Cook and his successful advancement as an amateur and his short career as an IFBB Pro. As a bodybuilder Cook was known for his massive X-shaped physique, full and round muscle bellies and especially huge shoulders and calves. 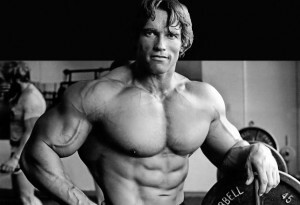 Moreover he had a charisma that really made him stand out in the world of bodybuilding. Cook got started in weight training and bodybuilding at an age of 18 and was actually serving in the Air Force at the same time. It didn’t many months of training before the young bodybuilder wanted to see if he could do some damage at the local bodybuilding shows. After approximately a year Cook finally decided to enter his first heavy weight line up at the local NPC Show “Mr. Anchorage” in Alaska back in 1996. The 19 year old bodybuilder was very successful and ended up winning the whole division and the overall. As a result of Cooks first win he was more or less committed to compete and becoming a pro one day. He competed more successfully every year since the day he made his debut as an amateur. After years went by the former Mr. Anchorage finally made it to the last steps as an amateur. This was at the NPC Nationals in 2003 and the super-heavyweight class. When it was time for the super-heavy division to go to war the eyes from the audience and the judging panel started to turn to Cooks direction. This was the moment, the breakthrough was finale here and every spotlight in the venue was pointed on him. Cook was impressive and ended up as the winner of the division – and did now go by the nickname of “The Blond Bomber” or “ The New Blond Bomber” – as “The Swami” himself Lonnie Teper named him. In spite of not getting the IFBB Pro card due to not winning overall class Cook had gained a lot of popularity throughout the industry. The Blond Bomber was covered in five of the biggest bodybuilding magazines in 2003. In addition to this he was also handed two endorsement deals, one with Weider and the other with MRM. These two deals meant that Cook’s economy was a lot better than before and that he could reload and go for his second battle of the heavyweights at the NPC National the following year 2004. After the win in 2003 Cook decided to take his training to an even higher level and gain a few more pounds until the next Nationals. Cook did additionally start do work with prep-coach Hany Rambod at Gold’s Gym in San Jose for the Nationals in 2004. During this period of time Cook did also get help from nutrition guru Chris Aceto, who agreed to stand by his on his mission on becoming a pro during the same year. As months and hard training sessions went by it was finally winter and time had finally arrived for the Nationals in November of 2004. The Blond Bomber returned to the stage weighing almost 40 lbs more than the previous year and was in great condition. Cooks characteristic 5’10 X-shaped physique was overwhelming on stage and he won the whole show – and now the overall as well. This meant that a dream had come true for Cook. The charismatic bodybuilder has succeeded, he was now finally in the Major League of Bodybuilding and he could address himself as an IFBB Professional bodybuilder. Then it was time for the big stages for Cook, the Pro debut for him went down the following year at The New York Cup 2005. He ended up taking the 6th spot and went on to compete at the Toronto Pro Invitational where he took 10th place. The following year he competed in the Arnold Classic and the Ironman Pro Invitational 2006. Cook finished at the 15th respective 10th place in these shows. Even if a 10th placing in a debut of the Ironman Pro was pretty good Cook could never the reach his former shape he had as an amateur. Something had happened and he couldn’t deliver at the level of 100 percent anymore. These two years went on pretty fast, and after his 10th placing in 2006 Cook decided to retire from competitive bodybuilding. Why he decided to quit only Cook knows himself. However, maybe new passions or other important things were on the rise in his life. Maybe he realized that it was enough for him – he had already accomplished the goal he set out when he was 19 the one of becoming an IFBB Pro – and it was time to turn his life into a new direction. In any case the Blond Bomber decided to walk away from competitive bodybuilding completely in 2006. After Cook left the industry everything became very quit around him. However, and as far as I know he went on to become successful in the financial sector and is living Southern California with his wife and their kids. When it comes to physical activities I have heard that he has a great passion for MMA a sport which he also trains. Regardless or reasons, there will be a moment in time when the competitive days are over for an athlete, or should be over. When this time arrive it’s highly important for competitive athletes in any sport to have a backup plan. This plan should provide something to fall back on. I am talking about different options of interest which is securing the economical and emotional issues when the former career is done. Thereby it is also necessary to have other interests or passions on the side of the competitive career, being a one-decisional athlete is never a good thing from my perspective. Remember that there is person and a mind behind all the years of hard training, all the hours, all the sets, repetitions and contest preparations. This person is a true working force who can at any moment in time when their careers are over use this power to become successful in a lot of different sectors, either if it’s inside the fitness industry or outside – you have a power that is extremely valuable. In addition even if Chris Cook’s retirement was a great loss for bodybuilding he made a historical impact and fulfilled his dream of becoming an IFBB Pro. In the end he also serves as a perfect example of those who showed that it works to use their bodybuilding discipline and hard working ethics to become successful in other fields of life.